Lemons are your friends all year around. Their health benefits are numerous due to their high concentration of vitamins B and C, antioxidants, protein, phosphorus, carbohydrates, volatile oils and flavonoids. Flavonoids not only help boost the potency of vitamin C, they improve blood flow, helping to maintain normal blood pressure and reduce inflammation. Lemons are a good source of electrolytes, such as potassium, calcium and magnesium, which help hydrate the body and regulate its functioning. 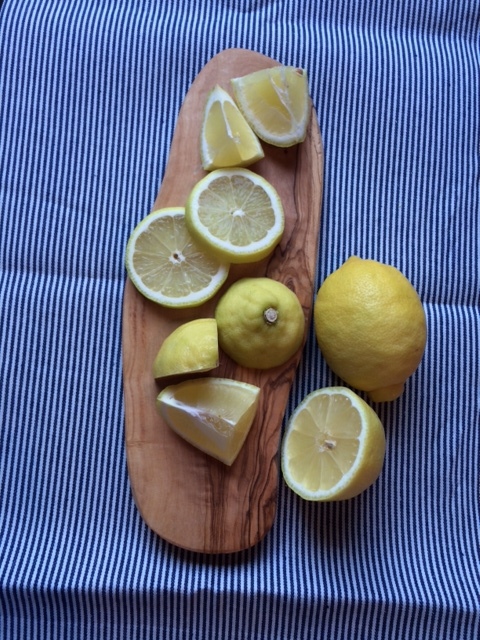 Lemons help the liver to dump toxins by stimulating its natural enzymes. This promotes good health and helps keep the skin clear. Because they provide a huge dose of the free radical fighting antioxidant vitamin C, they help keep skin even-toned and wrinkle-free. They also reduce acne, remove age spots, blemishes, scars and cleanse excess oil. The vitamin C, citric acid and alkaline properties fight bacteria both internally and on the skin. Lemons contain modified citrus pectin and limonoids, which have been shown in some recent studies to prohibit the spread of cancer cells, slow cancer cells growth and induce cancer cells death. Though acidic to the taste, lemon juice creates an alkaline-forming environment to balance the body’s pH and restore balance by providing vitamin C and high levels of potassium. So you have now a long list of arguments to love lemons! A good tip is to start your day with a cup/glass of warm water with lemon juice in it. You can of course also make lemon biscuits, lemon cake or even lemon curd… But all those are different stories. How do you include them in your diet? Thanks for sharing.